Some things are just meant for each other – peanut butter and jelly, peas and carrots, naps and rainy weather. Yes, a high-citrus mix might help beat your winter vitamin D-deficiency, but in our opinion, smoothies are made for summer. Just look at the day National Smoothie Day is celebrated: June 21, the first day of summer! So celebrate National Smoothie Day by blending together food, family, and fun in the sun as you kick off the first day of summer in style. Throw in your favorite mix of sweet juices, tangy fruits, fresh vegetables, and delectable surprise ingredients — and express your own personal take on the taste of summer. The popularity of green smoothies, consisting of raw, leafy vegetables such as spinach, kale, celery, or broccoli began growing rapidly in the early 2000’s. Kirk Perron, an avid cyclist and healthy-lifestyle advocate at Cal Poly, opens his first Jamba Juice store in San Luis Obispo, California — it's now the largest “smoothie store” chain in the world. Smoothies arrive in the U.S. Thanks to the invention of the electric blender, health food stores on the West Coast began selling smoothies. The actual term "smoothie" was in use in recipes and trademarks by the mid-1930s. Avocado, coconut milk…gummy bears? Sure, we all have our favorite blends, but try stepping outside the box away from “the usual.” This Smoothie Day, try swinging for the fences and see what you may have been missing. 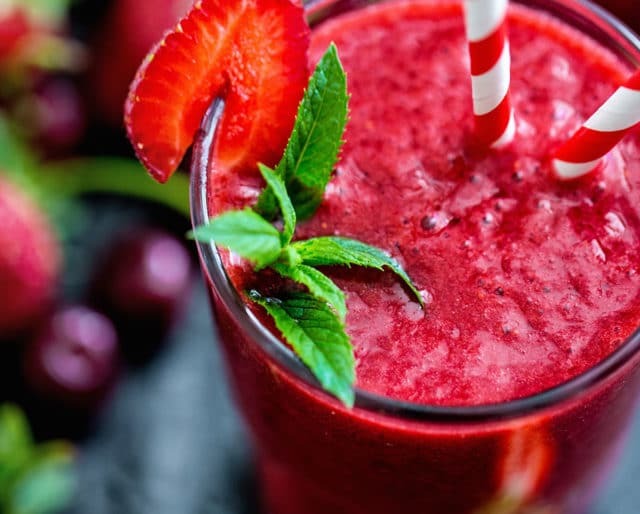 Surprise, surprise, smoothies can act as wonderful pairings along with your favorite “adult ingredient.” This June, throw a 21-and-over National Smoothie Day party and get together for a new type of mixer. Do you have a friend who thinks they know their smoothies through and through? Have a smoothie tasting and see how many ingredients you and your friends can name. Perhaps someone has a particular “smoothie pallet” they never knew about. Before the creation of the company, Jamba Juice was a "senior project" completed by Kirk Perron at California Polytechnic State University (Cal Poly). There are over 875 locations operating in 26 U.S. states, as well as Canada, the Philippines, Mexico, Taiwan, South Korea, Thailand and the United Arab Emirates. Jamba Juice’s secret menu includes smoothies containing Fruity Pebbles, gummy bears, and Pink Starburst, just to name a few. Ok, so not really, but in 2006, the company was acquired by the company Services Acquisition for $265 million, and was headed by Steven Berrard, the former CEO of Blockbuster. Smoothies are an easy way to nourish your body with vitamins, fiber, and protein. Often used as a supplement to exercising, smoothies provide essential nutrients to help your body recover. Depending on the weather, time of day, or just your personal preference, smoothies can be served hot or cold. Throw together your own unique blend of ingredients, and find the taste for you that best suits the scene. Smoothie ingredients are really quite simple, and require no cooking and very little preparation. Typically made up of fruits, vegetables, grains, yogurt, and ice, all you really need is a blender to enjoy an easy meal.